Yellow Diamond Buyers. - Yellow Diamond Buyers. Yellow Diamond Buyers are Nationwide Buyers of Fancy Yellow Diamonds and Yellow Diamond Jewelry, Sell Yellow Diamonds Today to Hamilton York 877-560-7070. Yellow Diamond Buyers is the leading worldwide buyer of natural large yellow diamonds paying top prices with immediate payment to our clients. 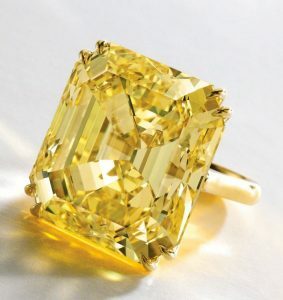 Yellow Diamond Buyers specializes in buying large, fine Natural Fancy Color Yellow Diamonds and Yellow Diamond Jewelry. Yellow Diamond Buyers is the Fancy Color Diamond Buying Division of Hamilton York Estate Buyers and can purchase your diamond jewelry regardless of your location. We have secure offices in California and Indiana but for most purchases we will meet you in your bank and pay you with an immediate wire transfer. The value of a yellow diamond increases dramatically as you approach the Fancy Vivid Yellow grade, assuming similar clarity grades. The clarity grades for Fancy Yellow Diamonds are the same as used for white diamonds. The scale as follows with the “cleanest” stones at the top and more heavily included stones as you go down the list. Diamond values also decrease as you go down the list. Yellow Diamond Buyers assure you professional treatment from the moment you submit the “Sell Yellow Diamond” information to us through the point the funds are securely in your account. For specific details on how we guarantee your security to Sell Estate Diamond, please visit our Diamond Buying Procedures page. To Sell a Yellow Diamond or Sell Yellow Diamond Jewelry, simply call us toll free (877) 560.7070 today! Perfect A+ rating with the Better Business Bureau. We welcome you to verify our credentials by clicking on the link below!